The act of two or more aircraft flying together in a disciplined, synchronized manner is one of the cornerstones of military aviation, as well as just about any organized air show. But as amazing as the U.S. Navy’s elite Blue Angels or the U.S. Air Force’s Thunderbirds are to behold, they remain essentially landlocked, anchored if you will, to our planet and its tenuous atmosphere. What if you could take the level of precision of these great aviators to, say, the moon? Essentially, trail formation means one aircraft (or spacecraft in this case), follows directly behind the other. Ebb and Flow, the twins of NASA’s GRAIL (Gravity Recovery And Interior Laboratory) mission, are by no means the first to synch up altitude and “air” speed while zipping over the craters, mountains, hills and rills of Earth’s natural satellite. That honor goes to the crew of Apollo 10, who in May 1969 performed a dress rehearsal for the first lunar landing. But as accurate as the astronauts aboard lunar module “Snoopy” and command module “Charlie Brown” were in their piloting, it is hard to imagine they could keep as exacting a position as Ebb and Flow. As the GRAIL twins fly over areas of greater and lesser gravity at 3,600 mph (5,800 kilometers per hour), surface features such as mountains and craters, and masses hidden beneath the lunar surface, can influence the distance between the two spacecraft ever so slightly. How slight a distance change can be measured by the science instrument beaming invisible microwaves back and forth between Ebb and Flow? How about one-tenth of one micron? Another way to put it is that the GRAIL twins can detect a change in their position down to one half of a human hair (0.000004 inches, or 0.00001 centimeters). For those of you who are hematologists or vampires (we are not judging here), any change in separation between the two twins greater than one half of a red corpuscle will be duly noted aboard the spacecraft’s memory chips for later downlinking to Earth. 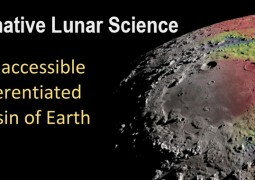 Working together, Ebb and Flow will make these measurements while flying over the entirety of the lunar surface. This begs the question, why would scientists care about a change of distance between two spacecraft as infinitesimal as half a red corpuscle a quarter million miles from Earth? Getting the GRAIL twins into a hyper-accurate formation from a quarter million miles away gave the team quite a challenge. Launched together on Sept. 10, 2011, Ebb and Flow went their separate ways soon after entering space. 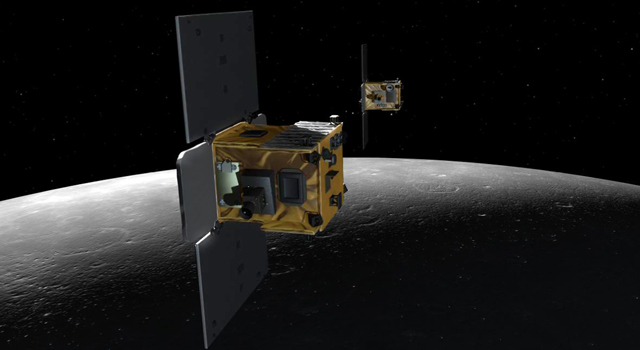 Three-and-a-half months and 2.5 million miles (4 million kilometers) later, Ebb entered lunar orbit. Flow followed the next day (New Year’s Day 2012). To reduce and refine Ebb and Flow’s orbits efficiently and precisely required the GRAIL team to plan and execute a series of trajectory modification burns for each spacecraft. And each maneuver had to be just right. Today, the calendar for GRAIL’s flight team remains a busy one with the day-to-day operations of keeping NASA’s lunar twins in synch. But as busy as the team gets, they still have time to peer skyward. NASA’s Jet Propulsion Laboratory in Pasadena, Calif., manages the GRAIL mission for NASA’s Science Mission Directorate, Washington. The Massachusetts Institute of Technology, Cambridge, is home to the mission’s principal investigator, Maria Zuber. The GRAIL mission is part of the Discovery Program managed at NASA’s Marshall Space Flight Center in Huntsville, Ala. Lockheed Martin Space Systems in Denver built the spacecraft. JPL is a division of the California Institute of Technology in Pasadena.